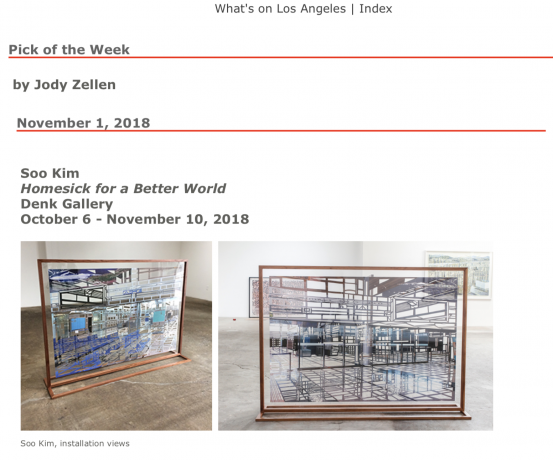 (Los Angeles, CA) - DENK gallery is pleased to present new works by Los Angeles-based artist Soo Kim in Homesick for a Better World. Kim's approach to photography is elastic and sculptural, challenging the potential applications of this traditionally deictic and technically restrictive medium. The photograph's innately archival and representational function tends to conceal rather than expose the artist's intervention in its making. Kim's practice, however, exposes these choices rather than dissimulating them, altering the image in a tangibly disruptive way. Through an elaborate and highly detailed process of cutting, folding, collaging, superimposition, and drawing, Kim's practice is materially metamorphic. By allowing the slower physical traces of the photo's modification to dominate, Kim alters the material pace of the image through primarily subtractive means. As interested in the omissions and negative spaces that interject her surfaces as in the admissions and disclosures of form, Kim's poetic excision and recombination of imagery deliberately interrupt the indexical authority of the photograph. Soo Kim's labor-intensive works treat photography as a primary material from which to generate new expressions and spaces. The resulting image takes on a complex multi-dimensional quality, as the inherent past tense of the photograph encounters a temporally ambiguous assertion of the present. 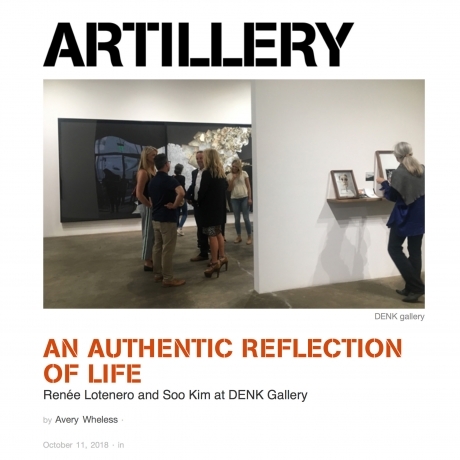 Kim reintroduces the singular to a constitutionally collective and reproducible medium, insisting on the photograph's unique existence as an art object with a Benjaminian dependence on time and space. Her pieces are even site-sensitive at times when installed, incorporating elements of their immediate surroundings, like the color of support walls subtly visible in moments of transparent negative space. Her interest in the inclusion of absence - whether in the voided striations opened by the cutting and drawing away of photo material or the structural removal and superimposition of entire areas - literally loosens the metaphorical cohesion of any single, definitive version of reality. The image of origin in Kim's work guides the process of its modification. Each piece by the artist is subject to its own set of intuitive choices, the imagery determining the formal and conceptual nature of the mediation. Kim has explored a range of themes, from urban spaces, cityscapes, and architectures to organic flora, landscapes, and even human figures. A series from 2012 explores Taipei at night, extracting large portions of the fenestration and signage to leave strangely abstracted glowing geometries in their place. Elysian from 2011, consists of shadow boxed images of the LA Park Kim has whittled into delicate, sculptural filigree trees with metallic undersides. An earlier series still from 2007, depicts Reykjavik, Iceland, at midnight during the perpetual daylight of summer solstice; the contours of the residential architectures heavily excised to produce a near-skeletal effect, like edifices stripped of skin. Included in Homesick for a Better World are two new photo-based works, sculpturally activated by their suspension and visibility in the round. This 'doubling' of the image, depicting two vantage points and physical sides simultaneously, speaks to the multiplicity of experience often belied by photography's unifying veneer. Kim fragments and de-constructs this visual information, puzzling apart its pieces as individual but mutually reliant parts of a system. Just as the exhibition title suggests, the work is in search of an evasive tense, a grammatically impossible futurity that nonetheless compels a feeling of nostalgia. At the core of these poetic new works is a physical gesture of removal that evokes the imprecision of longing. Kim's works have been exhibited at the Getty Center, Los Angeles; The 2002 Gwangju Biennale, Korea; Weatherspoon Art Museum, North Carolina; the Orange County Museum of Art, Newport Beach; Architecture and Design Museum, Los Angeles; Art Sonje, Korea; Islip Art Museum, New York; the Museum of Photographic Arts, San Diego; Susan Hobbs Gallery, Toronto; Frances Lehman Loeb Art Center at Vassar College, New York; Seoul Museum of Art, Korea; and the Honolulu Museum of Art. The artist is represented in several notable public collections, including The J. Paul Getty Museum, The Broad Foundation, The Albright-Knox Art Gallery, the Los Angeles County Museum of Art, Museum of Photographic Arts, San Diego, North Carolina Museum of Art, and The Escalette Collection of Art, Chapman University. Currently, she is Professor and Program Director of Photography and heads the Critic-in-Residence program at Otis College of Art and Design in Los Angeles.